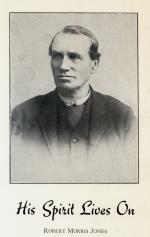 Robert Morris Jones, circa 1880. Slate shingle roofs that are nearly one thousand years old survive today on churches and castles in Europe. Although this remarkably durable stone had been quarried since medieval times, large scale operations only began in north Wales in the late eighteenth century. Slate began as a primordial mud that over eons was compressed into shale and then transformed by the heat and pressure of mountain formation. The unique feature of slate rock is that it can be cleaved into flat thin sheets. The value of slate for roof shingles was recognized by American colonists, who established small quarries in the 1730s just west of the Susquehanna River on the border of Pennsylvania and Maryland. The major Pennsylvania slate-producing region developed one hundred miles to the northeast just south of Blue (Kittanning) Mountain between the Delaware and Lehigh Rivers. 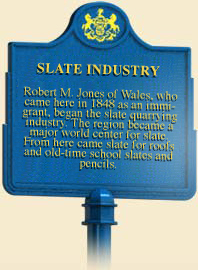 An area of only twenty-two square miles–the slate belt–would become the greatest slate producing region in the world. The first quarries opened in the 1830s, but significant growth would come later. One of the major events in the development of the region was the arrival in 1846 of twenty-four year old Robert Morris Jones, a native of north Wales who came to Pennsylvania to discover new deposits of slate and open new quarries. After a few years of working in the slate enterprise, he left the area, but returned in 1863 after several years of service in the Union army. From then until his death in 1886 he was involved in numerous slate operations around the new boroughs of Bangor–which was named by Jones because the slate there resembled that of Bangor, Wales–Pen Argyl, and Wind Gap. The slate industry consisted of a large number of small firms rather than a few large ones. At any given time there were usually dozens of quarries in operation. The quarrying and milling of slate employed a number of machines to cut and move large blocks of slate and to shape the slate. The critical splitting operation was done by hand with a hammer and chisel. Because of the limitations of the technology and the irregularities in the natural material, sixty to eighty percent of the slate ended up in giant waste hills adjacent to the quarries. View of the Art of taking Slates out of Quarries, Slitting, and Cutting. Driven primarily by the increasing demand for roof shingles, the slate industry expanded in the last two decades of the nineteenth century. Other uses included blackboards, smaller individual school slates, grave vaults and covers, billiard table tops, counter tops and shower stalls, and for telephone switchboards. At its peak in the first decade of the twentieth century, the Slate Belt accounted for about half of the slate produced in the United States. American production of roof slate peaked at 140 million square feet in 1903 and began to decline rapidly after 1910. Builders were switching to asphalt shingles which were cheaper and required less skill to install. During World War I, the owners of slate firms in Pennsylvania decided to close the quarries to release 3,000 men for other essential war work, especially in the Bethlehem Steel plant at Bethlehem. Many of the quarries that closed during war never reopened. 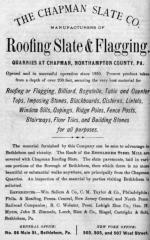 In the postwar years, the total quantity of slate produced continued to decline, but many non-roof shingle products, which commanded higher prices, sustained the industry during the 1920s. In most applications slate eventually succumbed to competition from plastics and other materials that were cheaper and easier to use. Charles H. Behre, Slate in Northampton County, Pennsylvania (Harrisburg: The Telegraph Press), 1927.